Been meaning to publish this image for a while. 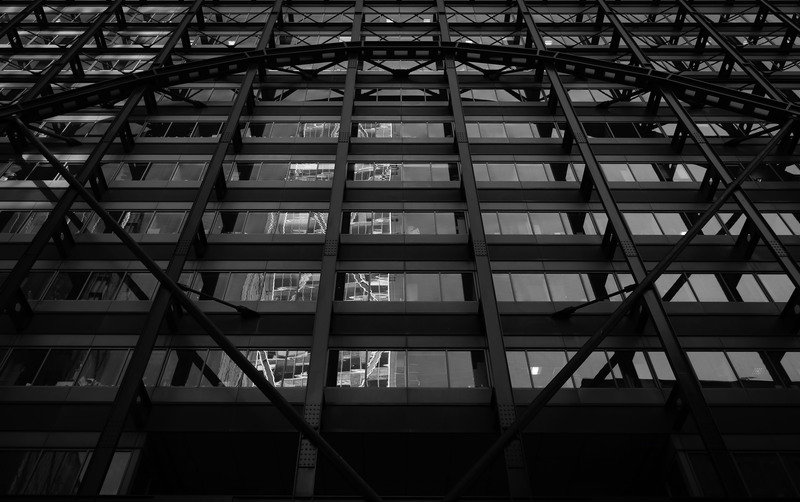 I shot it at the same time as the The Broadgate Tower. If you look closely, you can see the Broadgate Tower reflecting in the glass windows. This building is part of the Broadgate Estates and is called the Exchange House. It actually towers over the railway tracks above Liverpool Station. It was an overcast day so not much cloud definition in sight. Those kind of days have been way too frequent in London lately. Not encouraging if you want to shoot. Fingers and toes crossed the upcoming weekend will be better. I shot it using a wide angle lens and carried out some adjustments before finishing up in Photoshop. As I am not one to over edit, I only made some white balance and lens corrections before desaturating the image. I the finished up in Photoshop.